Picadilly Circus, London, few years ago. This was a diapositive from ca. 1964 which was digitalized and edited. Suggester says; This is absolutely outstanding picture. For a moment it feels like you are in the middle of fairytale; all those small details are fantastic! We still use those Taxis (The Austin/Carbodies FX4) today, with the last one being produced in circa 1995, tho they're not very common down south. it looks like a toy scale, simply amazing!!!!!!!!!!!!!!!!!!!!!!!! Soooooo lovely like toys ~! Wow, this looks absolutely amazing. <3 Congrats on the great work! Beautiful picture. Congratulations on the DD. pretty cool, thats about all I have to say just liked the picture. Oh, this is charming and amazing. I have no words! Really lovely. I love the effect. Reminds me of the beginning of the Sherlock BBC episodes! feels like a bunch of toys, like something you'd see in old claymation cartoons : D i love it! This is amazing! I love it! reminds me of home! Utterly wonderful and such a warm hearted glimpse into the world of "Swinging London". I so love the dreamy fashion in which the image exists. Much like you have actually pulled the moment out of someones treasured memory of London during happier times. Certainly have to say the use of technique makes it seem like you're looking at a HO/OO-scale train model. Three clues in the shot definitely date the picture to 1964, one even allows it to be narrowed to June to September 1964. The second is the BOAC billboard (above the Guinnes clock, right of the Coca-Cola billboard), which advertises the introduction of the Vickers VC10 into commercial service. This aircraft type was introduced into airline service on April 29th, 1964. The third, and most definitive clue would be the poster left of the Coca-Cola billboard: though slightly blurred, it is recognisable as the poster for the theatrical release of The Unsinkable Molly Brown featuring Debbie Reynolds and Harve Presnell: this movie was premièred on June 11th 1964, and was in cinemas for about 10 weeks. So most likely this picture was taken in the second half of June or the first half of July 1964, when the movie was still 'new' in cinemas. o_o I thought it was a miniature. Amazing. 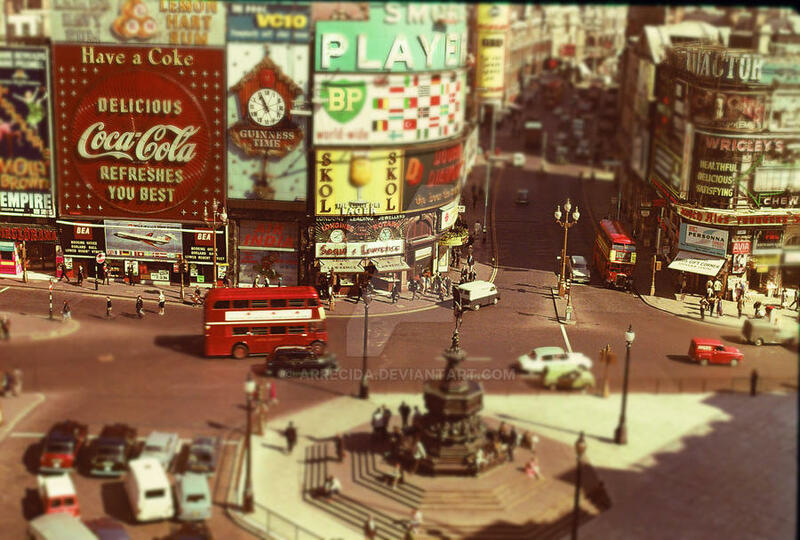 Fantastic tilt-shift, one of the best I've ever seen.